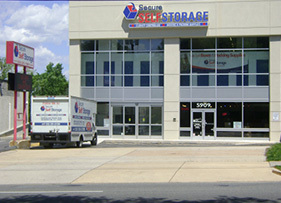 Secure Self Storage’s Manor Park location in Washington, D.C., provides the best equipped storage facilities at the best price. Located right on Blair Road NW, our facility is also convenient for residents of Silver Spring and Takoma Park, Maryland, as well as those in the Petworth, Fort Totten and Brightwood neighborhoods. Whether you need mini storage for a few personal items or a massive unit for business storage, you’re sure to find the rental solution that meets your needs. However many items you store in our units, you can rest easy knowing your possessions will remain safe with our state-of-the-art surveillance cameras and on-site staff. Come see for yourself what makes Secure Self Storage the most affordable and convenient full-service facility in the Washington, D.C. area. Google Rating: 4.6 out of 5 stars based on 23 reviews.